Meeting in Washington D.C. in March, the CGCN’s recent meeting focused on issues of religious liberties in North America and globally. Retired VA Representative Frank Wolf addressed the group and told of his new 21st Century Wilberforce Initiative that advocates religious freedoms. 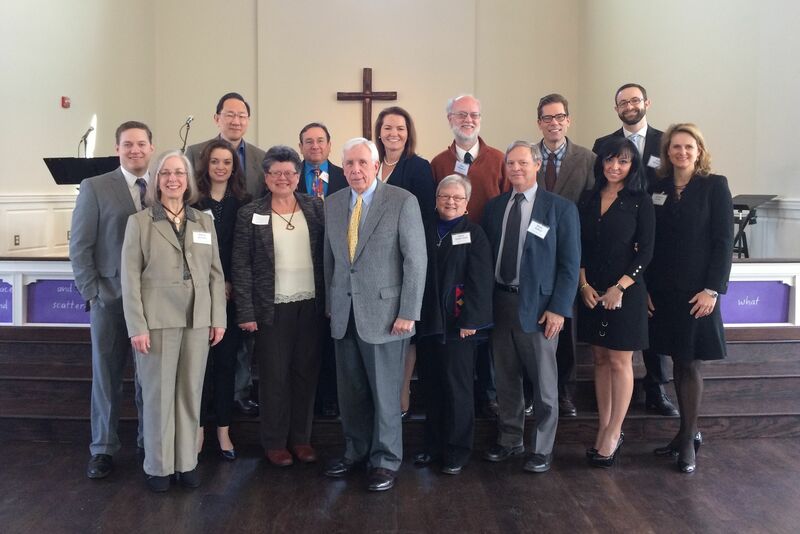 Retired Congressman Frank Wolf (Center) with members of the Common Ground Christian Network. The meeting included representatives of denominations and individual congregations including Anglicans (ACNA), Presbyterians (PCA, PCUSA, EPC, ECO) Methodists (UMC), and Lutherans (NALC) as well as para-church ministries. Speakers from the Family Research Council, The Institute for Global Engagement, the Southern Baptist Ethics and Religious Liberty Commission, the Institutional religious Freedom Alliance and others conveyed the various kinds of threats Christians face. From physical persecution in Africa and the Middle East, to legal intimidation in Europe and North America, the group discussed the many ways religious liberties are restricted. “As hostility toward Christians increases overseas and at home, Religious Freedom Restoration Acts and even the First Amendment won’t be able to protect us. Working together across denominational lines should be a top priority and will strengthen our message of the good news of Jesus Christ,” LaBerge said. The 2-day meeting concluded with the CGCN unanimously adopting the following statement of solidarity with persecuted Christians around the world. As members of the one Body of Christ, and knowing that we are exhorted by Holy Scriptures to do good to all, especially to those of the household of faith, (Galatians 6: 10) the Common Ground Christian Network, a coalition of Christians standing together for the cause of Christ, declares its solidarity with Christians around the world, persecuted for the sake of the Gospel. Christians in Sudan’s Nuba Mountains and Blue Nile State – targeted for destruction by their own government – forced by the Islamic Republic of Sudan’s constant aerial bombardment and attacks by militias to flee as refugees, or to hide in caves or bush, facing government-orchestrated starvation. We denounce the evil that destroys life and wages war against Christ and His Church, and we denounce the apathy and passivity that allow it to perpetuate. We commit to intentional, sustained prayer, waging spiritual warfare against this evil. We will speak out on behalf of those whose voices have been silenced or sidetracked. And we will take action on their behalf through organizations providing direct aid, and in our churches, communities, and government.